On a particularly hot afternoon last summer, people gathered near an elementary school in midtown Tucson, waiting patiently for their orders to arrive and chatting with one another about what they planned to do with their purchases. Some said they planned on making whole dishes, while others said they just like having it around because it is so amazing. Before long, a small white hatchback pulled up and parked across the street. The crowd formed a line behind the trunk as a smiling goateed man thanked everyone for their patience. With a click of his key the back of the truck slowly opened, sending a waft of fresh baked bread into the air. That’s one example of how Barrio Bread love started. 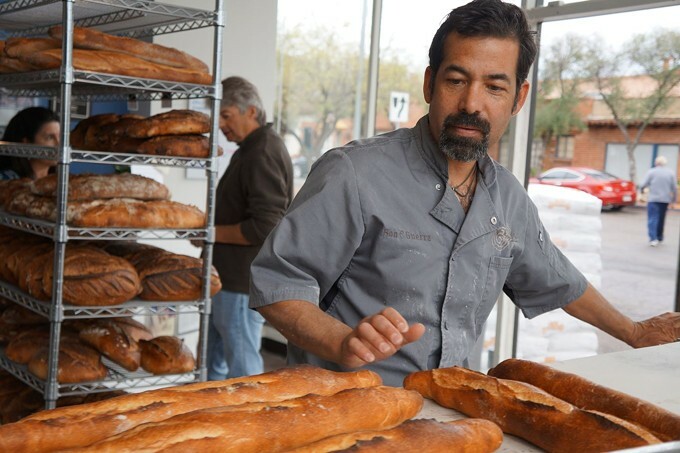 Don Guerra, the goateed one-man force behind Barrio Bread, has been creating hand crafted loaves of locally sourced wonder out of his garage since 2009, selling his goodness at locations around town from orders taken online, including area farmers’ markets. A former grade school P.E. 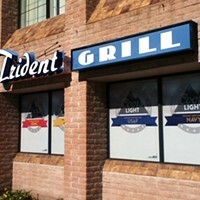 teacher, Guerra began his business as an almost word-of-mouth venture that has grown into a small empire of gluten rich delights now in a retail space on Broadway Boulevard. “I used to bake with my mom as a kid,” Guerra said, as he pushes dozens of sourdough miche dough balls into his three-ton oven imported from Italy now at his new location in the Broadway Village shopping area. Once you have had a taste of what Guerra does with flour, wheat, yeast and water, it is no surprise that people began to flock to him and his bread. Crispy, toothsome crusts that give way to a soft buoyant center, some with a sharp bite depending on the variety, some mellow and dense with a distinct nuttiness or even slight hint of fruit or cheese. This is not the type of bread that you purchase on the shelves at your local market; this is the type of bread thought lost through the seeds of time, baked with heritage flour and ancient grains to create a flavor profile that might be a bit shocking at first only because your palate needs a moment to delight in what is happening to it. Once the initial ablution settles, the wash of care, texture and provincial flavors take over making one question ever purchasing bread of far less caliber ever again. The days of selling his goods out of a car or on a small stand in farmers’ markets are all but gone, which most customers embrace since they know where to permanently find him now. Kids flock to Guerra to grab a pain d’epi baguette because they love the fact it is shaped like kernels of wheat and dedicated followers can buy a European rye that is made with organic fair-trade wheat or a fresh flat of focaccia anytime … or at least till the bread sells out, which usually happens. The best part is Guerra called his brick and mortar space his “bread studio” as it is open with the huge oven front and center so you can watch the master at work and see all the dedication that goes into each loaf.